Justin Bieber mania swept Mumbai on Wednesday as the Canadian pop star hit town to give his first concert in India in front of 45,000 fans. “Beliebers” from across the nation have flocked to the commercial capital to see their idol perform hits like “Baby” and “Sorry” on the latest stop of his “Purpose World Tour”. “I’ve been listening to his music for five years. I absolutely love him as an artist and I’m very excited to be seeing him,” 18-year-old student Rahul Tiwari, who had travelled from neighbouring Gujarat state, told AFP. Fans who gathered outside Mumbai’s airport got their first glimse of the superstar when he touched down in the city at 1:30 am on a chartered flight from Dubai. 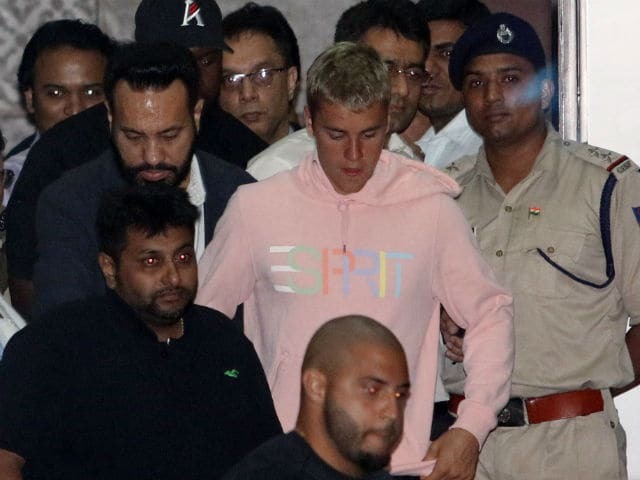 Indian television channels aired mobile phone footage of Bieber carrying a bouquet of flowers and wearing a pink hoodie, dark shorts and white trainers as he walked from the airport to a waiting car with his entourage. The 23-year-old is to perform to a sellout crowd at the D Y Patil Stadium, a venue more used to hosting cricket and football matches than international pop stars. “I’m a big Belieber. He’s attractive and makes peppy, catchy music for our generation,” 16-year-old Rhea Asrani, who also has a ticket for the concert, told AFP. “I have two huge posters of Justin in my bedroom and I listen to him often. I’m excited for the concert but more so just to see him live on stage,” she added. The award-winning singer is to start his show at 8:00 pm and is expected to perform for around an hour and a half, according to newspaper reports. India media have been abuzz with speculation about the singer’s movements while in the country and which Bollywood celebrities may or may not attend his concert and after-party. Several newspapers reported that Bieber will avoid Mumbai’s notoriously congested traffic by taking a helicopter from his hotel in the centre of the city to the concert venue. More than 1,000 security personnel, including 500 police officers, will be at the venue while Bollywood actor Salman Khan’s personal bodyguard is reported to be handling Bieber’s security while he is in Mumbai. Fans’ anticipation has been building since Bieber’s team first confirmed the gig date back in February. On Wednesday the Mumbai Mirror tabloid carried a story of 20 Bieber fans who camped outside the city’s international airport for three days hoping to catch a glimpse of their idol. They carried signs saying “We love you Justin”, “Welcome to India” and “Justin Forever”. “We have not slept for two nights, you never know when he will arrive,” said one fan. Another added that he hadn’t washed for three days.